They kicked every memory I ever had out of my head. Everything from before the attack is gone, so my dolls have to tell the story. Everybody has a happy place. This place is represented differently for everyone from literature to reality. It’s all about escapism, which can both be healthy or unhealthy depending on the circumstance. For me, my happy place, my escape, is film. For you, it may be books, music, or television. For others, it could be alcohol or drugs. A literary example is Sherlock Holmes’s mind palace. The fact of the matter is – it’s both a literary device and very real sensation that affects us all differently. For Mark Hogancamp in Welcome to Marwen, it’s more of a coping mechanism he resorts to after a tragedy, but the prerequisites for “happy place” are still in effect. What makes it that much more important in the long run is the fact that this film is based on a true story. As with several films based upon a true story, this flick suffers from a lack of direction, but it also suffers from storytelling. There are things to learn throughout your experience watching the movie, and it practically plays out like a mystery as the audience slowly begins to learn more and more about who Mark is and what happened to him in the past. That being said, the times you learn more about him aren’t met with any kind of surprise or anything else substantial that satisfies the audience when they finally learn what’s going on. It’s something that’s ultimately dealt with as matter-of-factly as if the viewer already knows…even though they don’t. The more this occurs, the less the film feels cinematic, and the more it feels rushed through. So, as messy as the film can sometimes be, it’s still somewhat strong when it comes to the matters going on behind-the-scenes, as I’ll mention later, but the bottom line is that the visuals and animation is very impressive and the cinematography was incredibly clever in the way that the film is shot in relation to separating reality and fantasy. I’ll get into that later, though. Let’s look deeper into everything. I’ll never shy away from the fact that the main, and possibly only reason for watching this film, was for Steve Carrell. I have consistently seen him as a very, very talented and often hilarious actor that excels in pretty much anything he attempts to do, and the same can be said here. Without Carrell, this film would be nothing. He is so good in this role that, in a way, he is virtually unrecognizable as the previous iconic boss of Dundler Mifflin. He fits into the role really well for what it’s worth, even if I don’t think he was exactly born to play it. I’ll be honest though, that’s where the positives of this category end. You can kind of tell they were at least trying to have a diverse set of characters, but none of it really mattered that much because I didn’t feel the chemistry. Not between the dolls, not between Carrell and Mann, not between the good guys and villains, nothing at all – and that really dragged down everything. As for importance, the film has a lack of any real direction, so nobody really holds importance. The most I can say about this is that everyone Mark meets influences his life and what’s going on in Marwen – but they don’t exactly have independent roles in the film. So…yeah. This category mostly did just fine other than the fact that there’s simply no real plot and any time there’s a glimpse of direction for the writing, the way its dealt with is so unfortunate that it really makes a lot of the rest of the film suffer, even though it technically holds strength in other areas. Seriously. This film is deep, and it technically has a great message, but because it has no real plot, the audience may often feel a lack of compelling moments in the film – so that meaningful message can easily be lost among the aimless direction. It’s pretty original, but again, that doesn’t really matter much when it’s not really going anywhere. I’d say as far as writing is concerned, it’s just unfortunate because it honestly has quite a bit of promise – it just never quite achieves its own potential. As far as strengths go, this is where Welcome to Marwen excels. It’s all about what the movie looks and feels like. The graphics and animation are very, very well done when you get right down to it. 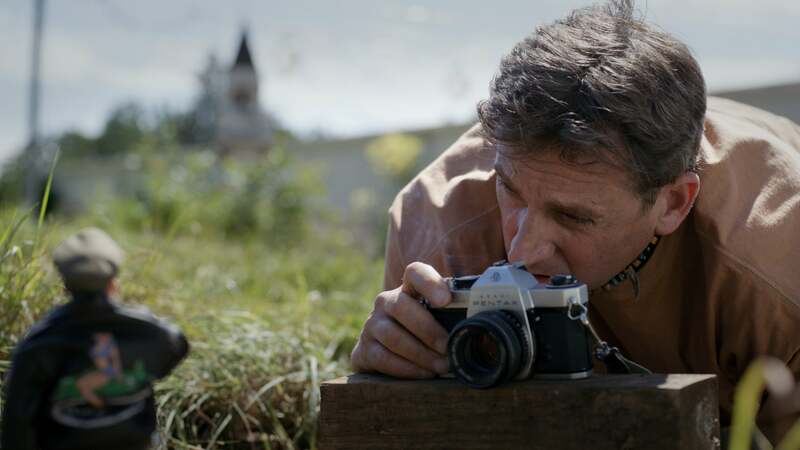 The cinematography is more clever than you think, especially when the film not only takes place in the Doll’s land of Marwen, but when the film transitions from the real world to Marwen. Everything is uniquely crafted to look extremely fascinating. The production design worked seamlessly with the cinematography to make the miniature world feel authentic. Even though you know these dolls are walking through grass, they play it as if it’s tall grass and weeds, and that’s just a small example in the film. Truly, this category was subtly brilliant. However, we all know that just because one category is wonderful doesn’t mean the rest of the movie follows suit. Now, Welcome to Marwen told a pretty solid narrative, even though there wasn’t any inciting incident. Part of the point of the film was to eventually find out what happened to him to get him to this point – which was the inciting incident, but the movie as a whole is the effect after the cause, so it ultimately feels incomplete, but the introduction does a fine job at introducing you to who Mark is and the imaginative town of Marwen, the obstacle is more subtle than anything, but you do get the general gist of what he’s trying to accomplish through his miniature obsession, the climax feels like a decent culmination of everything before it, and the resolution wraps everything very nicely, bringing everything back to a new sense of a norm. Here’s where it all boils down to for entertainment level. The film has no plot, so in a lot of ways, there’s not a lot of things that don’t keep me tuned in to what’s going on. There IS a point to everything, as this is a unique view on PTSD, but it just isn’t that riveting from any sense of the word. I mean, there are moments in the movie that you feel like you can’t miss because something important is about to happen, but that importance never really occurs…at least not in the way you’d imagine, so Riveting gets half points. As for having a good time while watching? Sure, I can absolutely appreciate the work put into the animation, visuals, and cinematography, and I can also very much appreciate the hard work Steve Carell put into his character. These things were all really well done and a treat to experience, but at the same time, the lack of any real direction made this film really boring to the point where no, I don’t care to see it again. No, I don’t want to buy it or own it. No, I don’t want to talk about it or feel the impulse to recommend it to others. It just fails in those areas. So, there’s not a whole lot as far as expectations go when going into this film. Because I’m a fan of Carell, I wanted to see him do well, and he does do very, very well – as mentioned before. That being said, he won’t really be remembered so well for this film because there’s not a lot of real plot, which makes it an ultimately forgettable film. As a true story, you want to learn a little something interesting about a true story, and a partial fantasy does just that, so that gets full points. As a drama, you want to see something emotional and important, and you also get that here. Full points. Finally, did they make the movie they inteded to make from the get-go? Yes. Full points.